IHG Rewards Club today launched very interesting offer for stays at select Kimpton hotels in the United States. Members that stay minimum for two nights and make a booking using specific Fash Sale rate (appears to be exactly the sale as the Best Flexible Rate) will receive free night certificate valid for stay at any IHG property through March 31, 2019. You can earn up to 15 free night certificate from this offer. The Flash Sale rate is exactly the same as the Best Flexible one. This promotion can work in your favor if you can find relatively inexpensive Best Flexible Rates for two nights at participating Kimpton hotels and plan to stay at expensive IHG hotel(s) where you can burn the free night cert(s) (make sure that there is award availability). 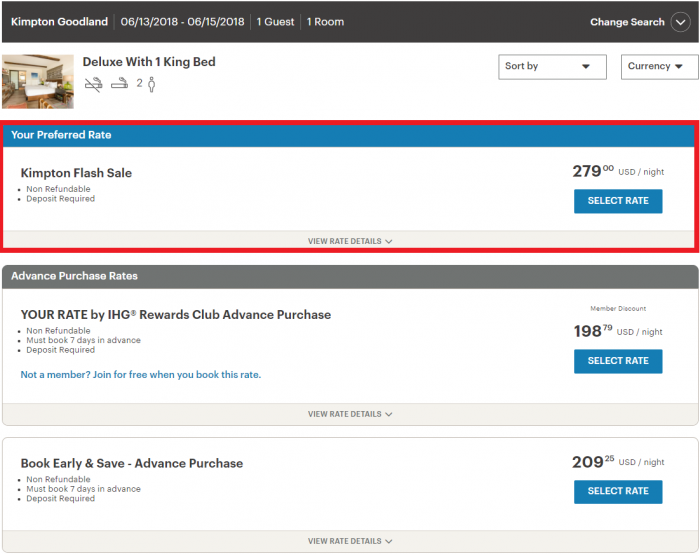 I guess that IHG/Kimpton plans to fund this promotion with the Best Flexible/Advance Purchase rate spread and hope that members use the free nights at hotels where the program reimbursement rate is not per the ADR (read the hotel occupancy level is high and they then get reimbursed based on the average rate paid by the guests for the night – read more here). You can obviously combine this with the current Accelerate and other promotion that we have written about here and here. Welcome to the terms and conditions, a.k.a. “small print,” where we are obliged to let you know this member exclusive offer is subject to availability and valid for stays from May 8, 2018 through September 16, 2018. Offer must be booked by May 9, 2018 or while supplies last under this exclusive rate code. Book by date is subject to change. The Free Night Certificate is valid at participating hotels in the IHG® Rewards Club Family of Brands and must be redeemed, and stay must be completed by March 31, 2019. This Free Night Certificate will be deposited into your account 2-4 weeks after you’ve checked out from your paid stay for this offer. Redemption is subject to availability and contains blackout dates that vary by hotel. This night is non-transferrable and cannot be redeemed for cash or anything else. The room must be booked by the member. You may only earn 15 total Free Night Certificates for the duration of this offer. The Free Night Certificate is valid for one standard room night rate only. Members are responsible for all incidental charges and applicable taxes. The IHG® Rewards Club Spire Elite complimentary room upgrade is applicable if available upon arrival. All reservations that will utilize the Free Night Certificate can be booked online at ihgrewardsclub.com or by calling the IHG® Rewards Club Service center at 1-877-318-5890. Individual hotel’s cancellation policy applies to the use of the Free Night Certificate. Cancellation fees apply if cancellation is made outside of the hotel’s cancellation time period. The Free Night Certificate rules and regulations are subject to change. The world being the way it is, additional taxes and fees may apply. Not valid in conjunction with any other promotions or offers. Not valid for discounted or negotiated rates, groups or existing reservations. Certain restrictions and blackout dates may apply. Finally, Kimpton Hotels reserves the right to cancel reservations booked with erroneous room rates.